The latest instalment in the Call of Duty franchise forgoes the single player campaign completely, and instead offers three unique modes: Blackout, Zombies, and multiplayer. Our Black Ops 4 guide has everything you need to know about the game, from best landing spots in Blackout to the top specialists in multiplayer and complete Zombies Easter egg guides. Black Ops 4 has some stiff competition in the multiplayer shooter genre, but it's managing to hold its own. Read on to dominate the competition with our Black Ops 4 guide. 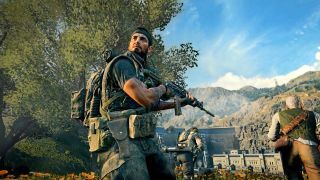 Black Ops 4 review: "Multiplayer shines like never before"
The lack of a single player campaign meant Treyarch went all in on developing the multiplayer aspects, and they delivered. The multiplayer is some of the most frantic and polished fun we've seen in years from the franchise, and there's a number of Zombies maps available with extravagant Easter eggs to keep players coming back for more. Blackout can't quite compete with Fortnite and Apex Legends, but it's still a fun time, which is why we gave the game four stars out of five in our Black Ops 4 review. Just like all recent Call of Duty games, there's a wide arsenal to pick and choose from before you jump into a multiplayer match. It's hard to know exactly which the best guns are in the game though, so if you want to get off to a head start in your first few hours with the game, check out our guide to the best Black Ops 4 weapons. Alongside the weapons, you also need to choose your favourite of the Black Ops 4 specialists before you start a match. Each one offers unique and powerful possibilities if you play them right, but which specialists are the best? Let us help you out by taking a look at the top specialists depending on your style of play. There are a number of Black Ops 4 Dark Ops challenges for all three game modes, so no matter which mode you're jumping into, make sure you're following our guide on all of the secret Dark Ops challenges. These aren't explained to you in-game whatsoever, so you'll definitely need a guide if you hope to complete them all. Blackout can be an unforgiving place if you're not used to a battle royale environment. You can't jump straight back into the action because you don't respawn, there's a plethora of items exclusive to Blackout, and there's a huge map you have to explore. if you're struggling, reading our Black Ops 4 Blackout tips will help you survive longer and eventually earn a victory. The Black Ops 4 Blackout map is absolutely huge when compared to a normal multiplayer map, and choosing where to land can be an enormous pain. If you haven't explored the map yet, take a look through our guide to all 15 locations on the map and pick your preferred location. Alcatraz is the second map to come to Black Ops 4 Blackout, and it's introduced some interesting new mechanics. There's far less players in each match, as it's limited to 40, and when you die, you can respawn - as long as someone else on your team is still alive. The Black Ops 4 Blackout Alcatraz map is much smaller, but if you want some help knowing where to land, read through our guide. Blackout has a lot of specific challenges that are unique to the mode, and they will take a long time to complete. It's helpful to know exactly what challenges are on offer though, which we can offer with our Black Ops 4 Blackout challenges guide. We've also included the specific Blackout Dark Ops challenges for good measure. There's a bunch of unlockable characters in Blackout, but chances are you won't figure out how to unlock them just through playing. Each one has a specific mission you have to complete, and they're not easy. Luckily for you though, we've got all of the Black Ops 4 Blackout character missions right here. On the main Blackout map, there's a number of helicopter spawn locations. The helicopter is the fastest and easiest way to travel long distances in Blackout, so it can often be a necessity to know where the nearest possible helicopter is. If you don't know all of the spawn points, make sure you read our guide to the Black Ops 4 Blackout helicopter locations. The world renowned Call of Duty Zombies have seeped through into Blackout, and there's a number of Black Ops 4 Blackout Zombie spawn points to fight these brain hungry monsters at. Killing them all in that area will reward you with a mystery box, so it's definitely worth hunting them down for some of the best gear in the game. The zombies aren't the only thing that have made their way into Blackout from the Zombies mode. You can also find the famous Ray Gun, one of the best and most historic weapons in the Zombies mode. It's not easy to get though so make sure you're following our guide on how to get the Ray Gun in Black Ops 4. There's a number of Zombies maps available to play in Black Ops 4, and IX throws the player back in time to a Roman coliseum. Zombie tigers and gladiators are just two of the enemies you'll face as you complete the Black Ops 4 Zombies IX Easter eggs with our complete guide for every step. After defeating the hordes of Zombies in the coliseum, the gang travel to the Titanic for another treacherous adventure after they try to steal an ancient relic. Our Black Ops 4 Zombies Voyage of Despair Easter eggs guide covers everything from the Pack A Punch machine to the final boss fight, so good luck! The third Zombies map in the game thrusts players into Alcatraz prison - the same prison featured in the new Alcatraz Blackout map - and there's a lot of ravenous inmates to deal with. Just like all the other Zombies maps, there's some obscure and difficult steps to complete for the Easter egg, so make sure you're following our Black Ops 4 Zombies Blood of the Dead Easter eggs guide. Dead of the Night is the name of the first DLC Zombies map in Black Ops 4, and players are thrown into an old English mansion. This time however, there's werewolves to deal with as you try to solve the crazy puzzles in and around the mansion grounds. There's a slim chance you'll be able to solve them without a guide, so look to our Black Ops 4 Zombies Dead of the Night Easter eggs guide for the solution. Need more shooters in your life? Take a look at our best FPS games list.